Are you a first year or new transfer student? Do you want to get involved on campus? Well here is your chance to learn about yourself and Hofstra University with the Discovery Program. The Discovery program is a dynamic, interactive program designed to help students transition to college through their experience and participation in advocacy, community service, outdoor exploration and reflection. You can choose from three different tracks to participate in. Students participating in this path will develop an understanding of how community organizations are managed and the strategies they use to empower communities to take action. Students, who choose this path may participate in maintaining the local community center, working with non-profits or brighten the walls at a local youth center by painting. Students participating in this path will explore the outdoors and challenge themselves by taking risks while reflecting on living life intentionally. Students, who choose this path may participate in team building and cooperative game activities, high and low ropes course, canoeing, hiking and orienteering. After the activities, the students will have time to reflect on the day and discuss how to live life intentionally. Students participating in this path will enhance the leader within them by learning different leadership styles as well as their top leadership strengths. They will experience firsthand what being a leader means and what it takes to be a leader among fellow peers. 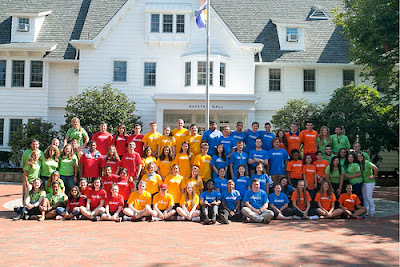 Students may participate in intensive team building activities such as high and low ropes courses, the Leadership Practice Inventory, an assessment to achieve the extraordinary as well as work with faculty and administrators on campus to build connections and their leadership skills. First year and new transfer students who decide to take part in the Discovery Program will be able to move on to campus Sunday, August 27 and will be taking part in programing until Wednesday, August 30, which will then lead in to Welcome Week! Participants are led in small groups by upperclassmen Discovery Leaders who have participated in the Discovery Program their first-year at Hofstra as well! Additionally, there will be faculty, administrators and community partner who share the same passions for discovery heightening their experience. This is an opportunity for first-years and transfer students to build connections, hone leadership skills and begin the transition to college life and learning. As a participant in the Discovery Program, students take their first step toward discovering their path here at Hofstra University. The fee for the Discovery Program for 2017 is $500, which includes on campus housing, meals, transportation, T-Shirt, water bottles, and program expenses. Sign Up TODAY by going to Hofsta.edu/Discovery or email us with any questions as DiscoveryProgram@hofstra.edu. Deadline for applications are August 4th!